Kraft Stove Top Chicken Stuffing Mix - For chicken with real chicken broth. Serving suggestion: makes twelve 1/2-cup servings. Twin pack equal to 2, 6 oz boxes. Saucepan: 1. Boil 1-1/2 cups water and 1/4 cup (4 tbsp.) spread* in medium saucepan. 2. Stir in contents of stuffing mix pouch; cover. 3. Remove from heat. Let stand 5 minutes. Fluff with fork. Microwave: 1. 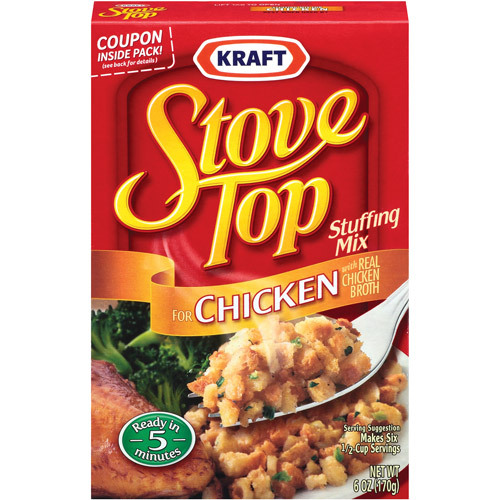 Mix contents of stuffing mix pouch and 1-1/2 cups hot water in 1-1/2-quart microwaveable bowl. 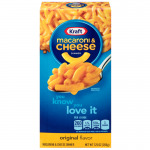 Ingredients: ENRICHED WHEAT FLOUR (WHEAT FLOUR, NIACIN, REDUCED IRON, THIAMIN MONONITRATE [VITAMIN B1], RIBOFLAVIN [VITAMIN B2], FOLIC ACID), HIGH FRUCTOSE CORN SYRUP, ONIONS*, SALT, CONTAINS LESS THAN 2% OF HYDROLYZED SOY PROTEIN, YEAST, PARTIALLY HYDROGENATED SOYBEAN AND/OR COTTONSEED OIL, COOKED CHICKEN AND CHICKEN BROTH, CELERY*, MONOSODIUM GLUTAMATE, PARSLEY*, SPICE, MALTODEXTRIN, POTASSIUM CHLORIDE, SUGAR, TURMERIC, DISODIUM GUANYLATE, DISODIUM INOSINATE, NATURAL FLAVOR, WITH BHA, BHT, PROPYL GALLATE, AND CITRIC ACID AS PRESERVATIVES. *DRIED. 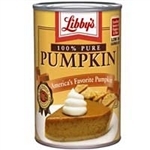 My whole family love this stuffing. I am delighted to have found this source. I hope to stock up even more for Christmas. Take your pick, chicken, turkey, pork, cornbread, herb. They are ALL delicious. Such a good price too, even compared to AMAZON. 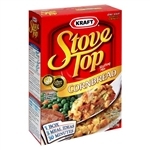 My wife adores this stove top stuffing and is just perfect for Christmas and the turkey. Superb delivery and at a great price.